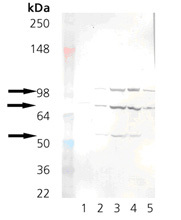 Application Notes: Detects three bands of ~94kDa, ~78 kDa and ~55kDa by Western blot..
Western blot analysis: Lane 1: Grp78 (BiP) recombinant protein (Prod No. ADI-SPP-765), Lane 2: RK-13, Lane 3: Mouse liver microsomes, Lane 4: Rat liver microsomes, Lane 5: HeLa Cell Lysate (heat shocked) (Prod No. ADI-LYC-HL101). Immunofluorescence analysis of endoplasmic reticulum staining of mouse C2C12 myoblasts transfected with wild type mouse ADAM12 using KDEL (Grp78, Grp94) mAb (10C3). Immunohistochemistry analysis of human spleen tissue stained with KDEL, mAb (10C3) at 10µg/ml.